I am a huge fan of Laura Geller Beauty and Makeup products and I can’t believe I was only introduced to the brand last year. I have a collection of all my Laura Geller Posts here so you can have a nice little wander if you are interested. I always feel incredibly lucky whenever I get a parcel from Mark McDonald Consultancy and they always hook me up with Laura Geller products. 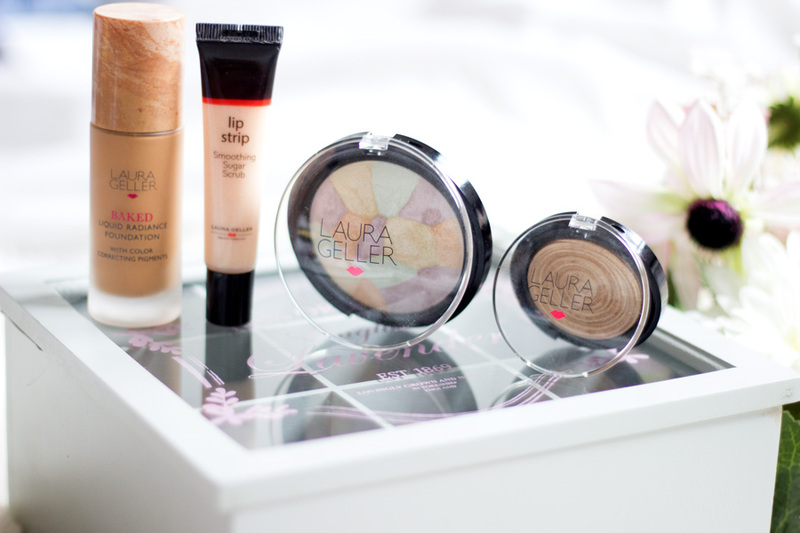 They recently gifted me some new products to try out and I am always very delighted to open Laura Geller packages. 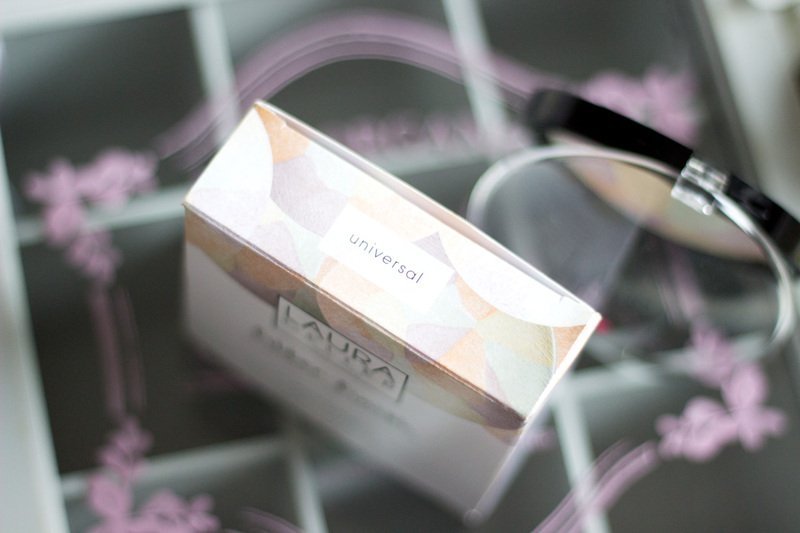 I even have a dedicated Muji Drawer for majority of my Laura Geller stash. I am even more delighted to know that there is a Laura Geller Counter in Elys Wimbledon which is very close to my house and I have popped in there a few times already!!! Anyway, I thought I might share a quick run down of these new products and my experience with them. I am planning a video and a tutorial soon so you can see how these products look, this is more of a first impressions post. It’s no news that majority (if not all) Laura Geller beauty products are baked and that’s what makes them stand out from many other brands. The Baked Liquid Radiance Foundation is certainly my first time trying out a baked liquid foundation. Laura Geller Beauty describes as the ultimate colour correcting, full coverage and colour correcting foundation that delivers a natural flawless and radiant finish. Essentially, the colour correcting pigments are baked on terracotta tiles in Italy and then infused with skin loving antioxidant and botanical extracts including Aloe Vera, Vitamin E, Blackcurrant Seed Extracts, White Tea Extracts, etc. Armed with this fabulous description, I decided to give it a try for a few weeks. First off, I love the packaging. It comes in a glass bottle (not the best for travelling but not too heavy) complete with a pump and a lid. I love the design of the lid as it has designs of pigments. 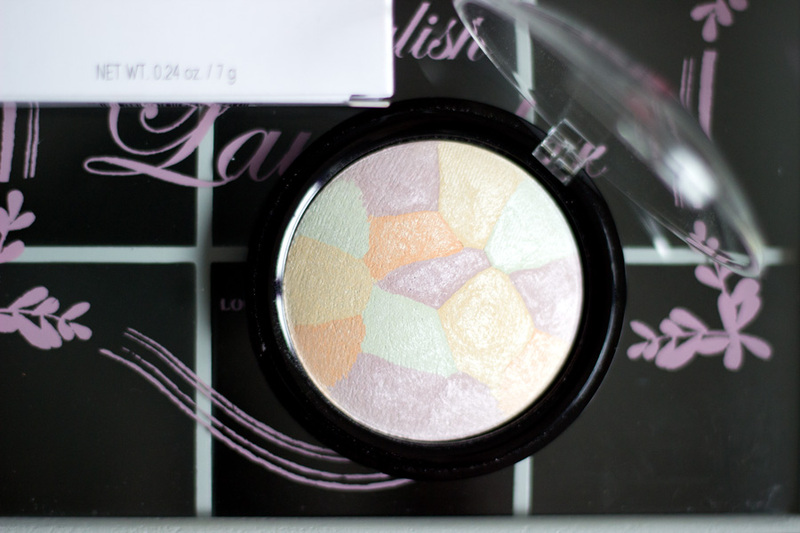 It's really pretty and it actually matches my Laura Geller Balance-N-Brighten Baked Foundation’s mosaic design. I like that it’s a transparent bottle so I can see how much product I have left and most of all, I am delighted it has a pump. 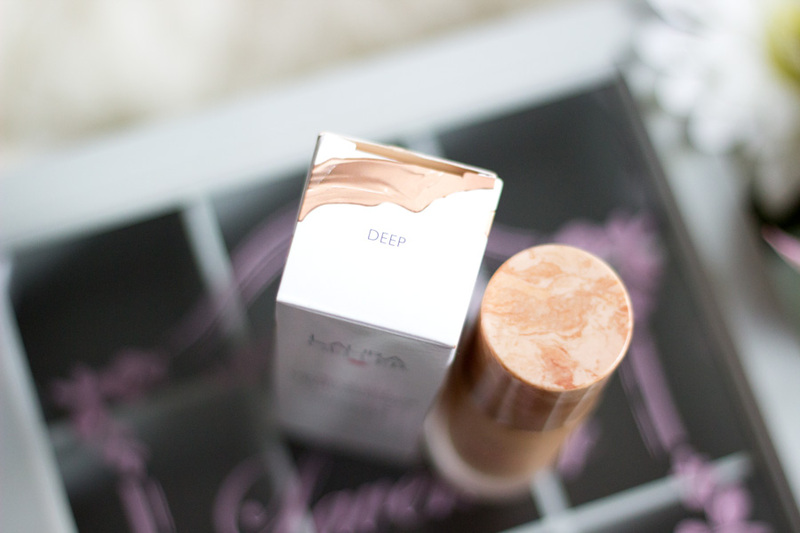 Foundations without a pump (or at least a sensible applicator) are a serious no-no for me. I was a little alarmed with the texture as it looked quite thick. It was all false alarm because it blended out to a really light texture. I was very surprised by this, however it is a water based foundation so I can see how it works. My shade is Deep (which is pretty much my usual shade within the brand) and they have about 9 shades in total. These shades include: Porcelain, Light, Fair, Medium, Golden Medium, Sand, Tan, Honey and Deep. They don’t have the widest shade range but I think they did okay. If you are darker than me, you would not find your shade (at the moment). I prefer to use a buffing brush or flat top brush to apply this foundation although I do think a Beauty Blender would give the best results. I don’t have to do too much colour correction with this foundation because it already has these colour correcting pigments infused within the formula. I would say it offers a really good medium coverage and can easily be built up to full coverage. It does not feel cakey if you build it up and it blends so well into the skin especially when you use the right tools. Now, combination-oily skin girls, listen up- --> it would make you super, super radiant aka dewy/glow inducing. I am not a huge fan of a dewy finish as you would know if you ready my blog regularly so I always use a mattifying primer under and the Laura Geller Balance-N-Brighten Baked Foundation Powder to set it. You guys, it looks amazing when I do these steps. It still retains that innate glow that matte foundations or powders steal away from you and I love this effect it has. In terms of wear, I would say it does wear really well through the course of the day but it has some oxidation going on. I feel like it would be my absolute complexion match when it's Summer so do bear that in mind when color matching. It is not the longest wearing foundation I have tried but it definitely last longer than many other foundations in my stash. If you have dry skin and you are struggling with getting a radiant glow, you would love this foundation. It retails for £28 and it’s so worth it. I have seen many of these beautiful mosaic designed powders on Instagram and I always wondered how they would fare on my skin. I am so glad I finally had a chance to try one out and I am loving it. 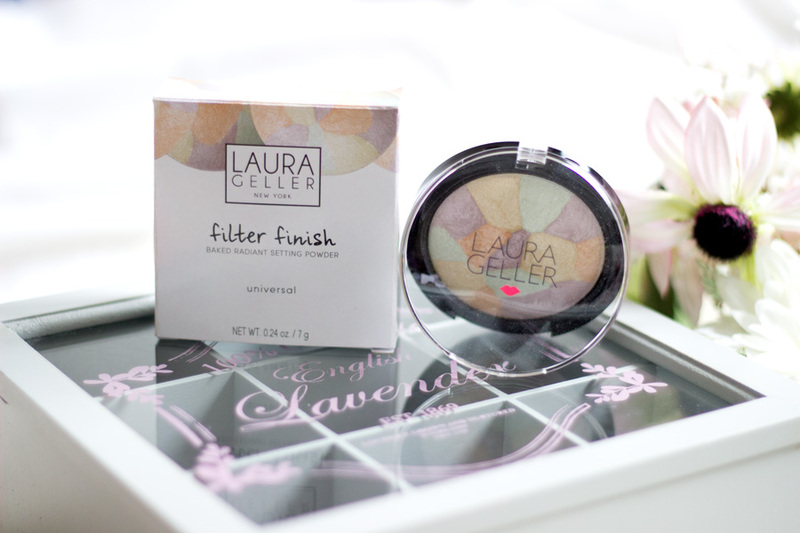 Laura Geller Beauty describes the Filter Finish Powder as a sheer silky finish powder which is designed to create soft focus perfection. As with many Laura Geller products, the pure pigments are baked to give a soft blurring effect, balance out the skin tone and illuminate the face all with a radiant finish. It has four shades infused in its beautiful design and they include: Lavender (for brightening), Green (neutralzing redness), Yellow (for camouflaging dark under eye circles) and Peach (correcting blue tones). 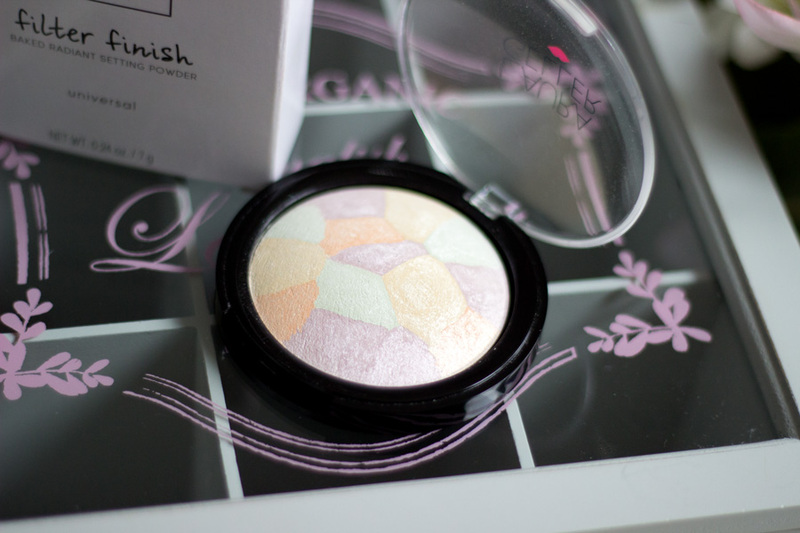 The packaging has a transparent lid which I like because it means I can admire this beauty without opening it. The first time I used it, I went a little crazy. I used a Powder Brush to swirl (rather heavy handed) the surface and applied straight to my face and I looked a hot ashy mess. Lesson learned!! If you have similar complexion with mine, you want to go really light handed with this as the littlest amount goes a looooooooooooooong way. I use a Duo Fibre brush which diffuses the product and it looks incredible on my skin. I just lightly swirl my Duo Fibre Brush to get a good mix of all the pigments and apply around my face especially areas with enlarged pores. It really lives up to its name as my face looks flawless. My pores are nowhere to be seen and it even helps lightly mattify my face so shine is completely banned. I use this when I am taking photos and filming as it looks amazing both in real life and in videos. There is only one shade- Universal which I feel would suit everyone but you need a light hand/application the darker your complexion is. Once you find the right amount that works for your skin tone, you would be absolutely fall in love with it. Laura Geller Beauty describes this scrub as a gentle exfoliating sugar scrub which cools on contact as it polishes off the lips to a petal-soft finish. I completely agree with this description. I have a few lip scrubs but they come in a pot which makes it a little tricky and messy to use. I love that this Lip Scrub comes in a tube form and it’s so easy to use on my lips. I just give the tube a little squeeze to get some product out and I apply it directly from the tube to my lips. I massage this in with my fingers and it does an amazing job and exfoliating any dry/chapped areas. It does a really good job especially for those mornings when I want to wear a matte lip and I have forgotten to exfoliate the night before. It has a cooling effect which I think may be due to its peppermint content. It feels very soothing and smells lovely as well. 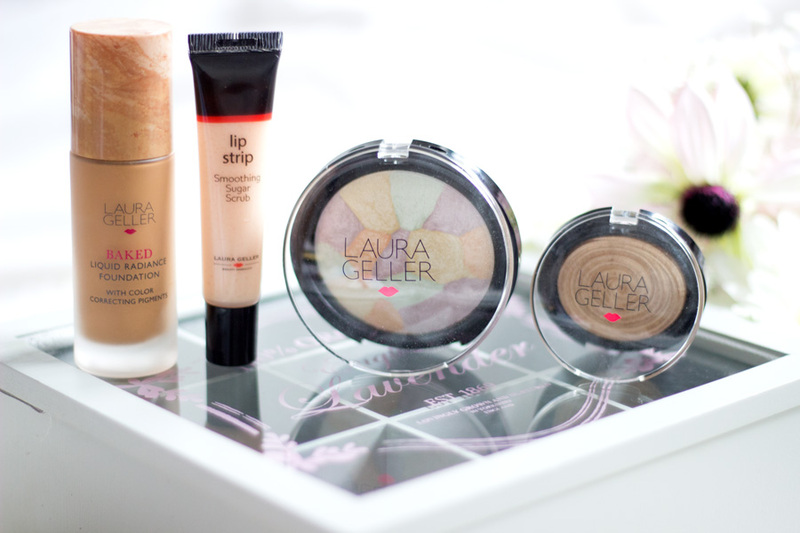 I feel so grateful to always get these amazing Laura Geller products to try out and I have enjoyed using them. 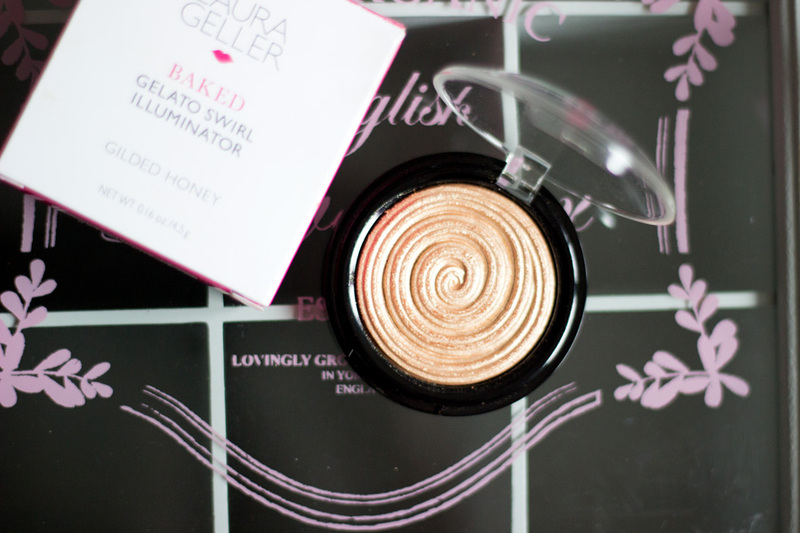 I reach for a good majority of Laura Geller products on a daily basis because they are one of my favourite brands. I hope you enjoyed this post and I would see you in my next one. 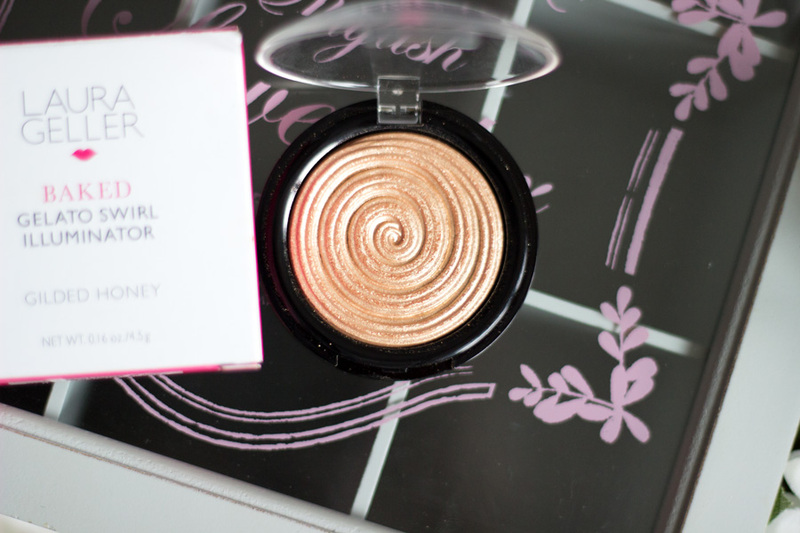 If you only had buy one product, I would suggest the Gilded Honey Illuminator because it works so well on many skin tones and the results are long lasting (almost all day). You can purchase Laura geller products from various retailers in the UK including House of Fraser, Debenhams, Beauty Bay, Cult Beauty, Feel Unique, Escentual, etc. That’s pretty much it from me!! Have you tried any of these Laura Geller Beauty products? I have seen the highlighters on instagram they look gorgeous, especially this gold shade! I see Laura Geller on a lot of American blogs, the highlights are meant to be insanely good, not tried anything from the brand.